Anti-constitutionalists are why the rest of the citizenry cannot have less government, much less a constitutional one. On Saturday, March 24, 2018, Parkland students, along with thousands of their supporters, descended upon Washington, DC protesting the people's right to keep and bear arms while demanding Congress enact gun-control, aka people control, legislation. 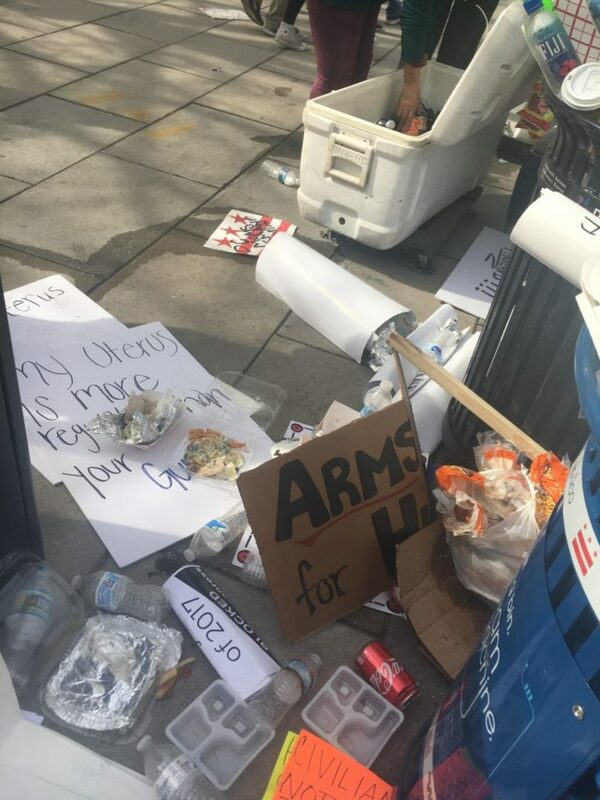 In the wake of their "march," anti-gun protesters left piles of trash in the streets. It has been said, "A picture is worth a thousand words." 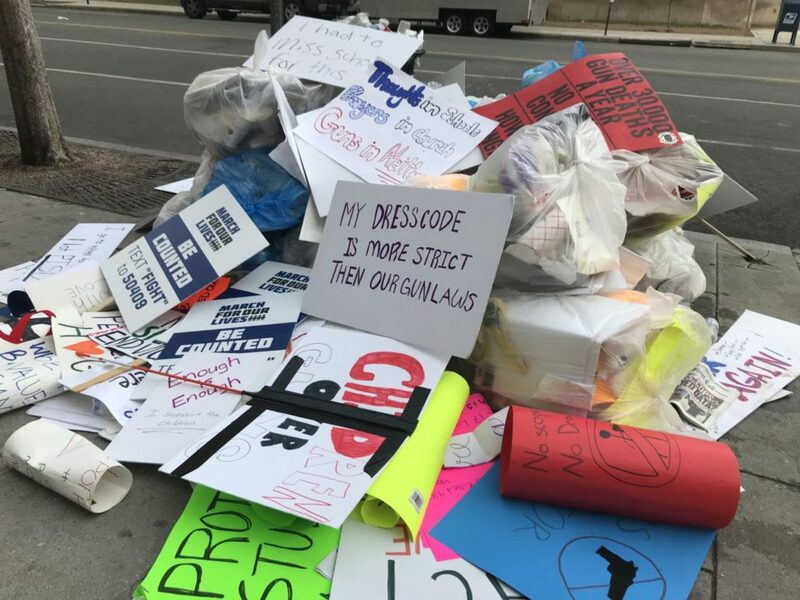 Cardboard signs bearing messages such as “My dress code is stricter than your gun laws,” and signs demanding that no money be sent to the pro-gun National Rifle Association were tossed aside like yesterday’s news. 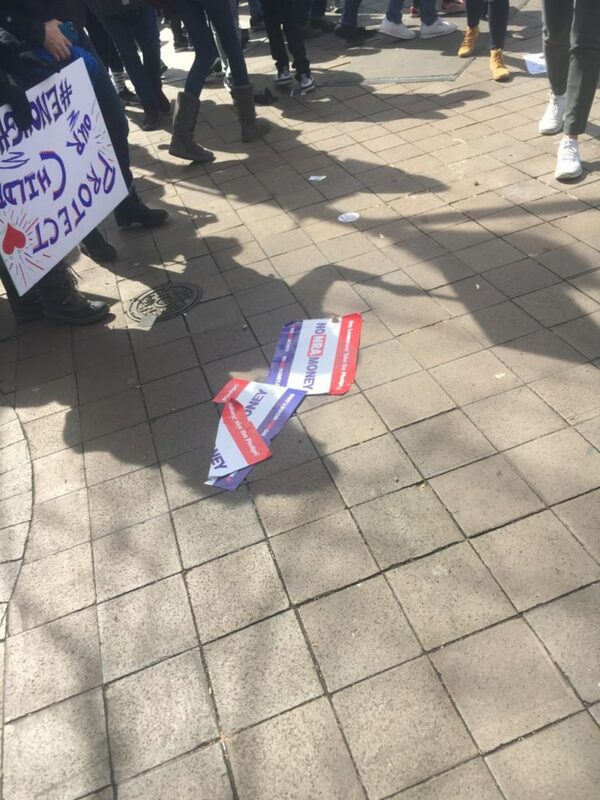 The crowd not only tossed aside their messages – they also left scraps of food on the ground. Many protesters have a history of leaving behind their trash without thinking about the environment around them. At the 2017 Women’s March on Washington, the p***y-hat wearing protesters along the march route refused to pick up after themselves, leaving a trail of coffee cups along the march route. 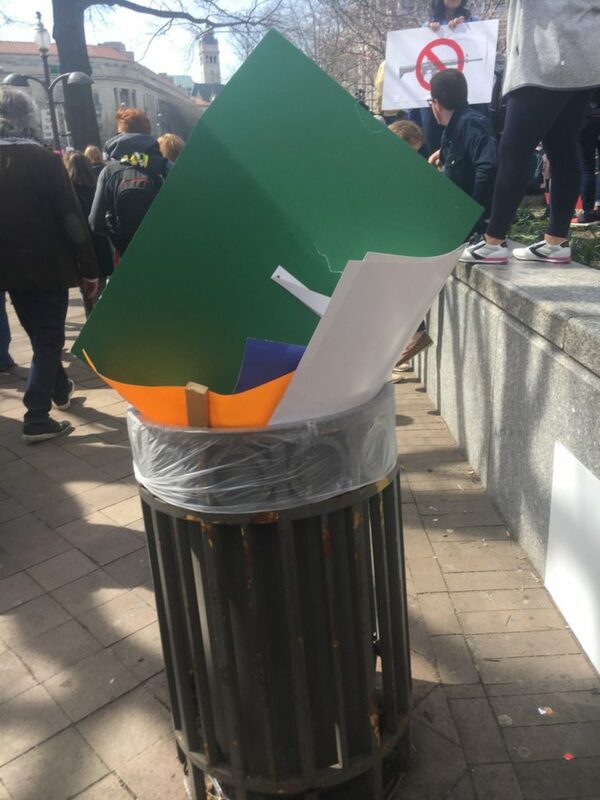 The trend of protesters discarding their trash along protest routes is not limited to D.C. In 2014, 400,000 environmentally-conscious people marching for climate change in New York City littered the streets with their trash. This is how individuals accusing others of not caring about the republic show their care for the republic – they trash the capital of said republic. The same courtesy and respect these gun-grabbers show to those who hold a differing opinion they show the capital. Granted, the District of Corruption is full of criminal politicians; however, it is still our republic's capital. It is disrespectful to trash any city or town – fellow citizens reside there. One can bet these people place their trash in appropriate containers in their own home. While some who are constitutionalists would do the same and some anti-constitutionalists would not, those protesters who saw fit to leave their trash on the streets echoes their verbal trashing of good people, law-abiding citizens and gun owners and further stereotypes the entire group. By now, most of America has heard the Parkland students' ridiculous, slanderous, and false rhetoric over the right to keep and bear arms. These same students defended the Broward County Sheriff's office, the Sheriff, and the School Resource Officer (SRO) for "standing down," not confronting the shooter. In summation, these individuals suggested that even a good guy with a good could not stop a bad guy with a gun. This is their argument against teachers being armed. And, their argument against increased SROs for schools boils down to "perpetuation of the school to prison pipeline", which has been debunked numerous times. But, these protesters, anti-gunners, pro-gun confiscation individuals ended up being surrounded by "good guys with guns," because it is effective, to protect them. Hypocrisy much? According to Twitchy, "The 'good guy with a gun isn't effective' talking point has been suspended for the day." You can't bet your last dollar to a dime these anti-constitutionalists do not want to address this at all. In fact, these "children" refuse to consider any other point besides their own, which the lamestream enemedia supports, probably gave them the talking points, and keeps pro-Second Amendment students and parents from being heard. Andrew Pollack lost his daughter, Meadow Pollack, during the Valentine's Day shooting at Marjory Stoneman Douglas High School in Parkland, Florida. Meadow was shot nine times, five at point blank range after she crawled to cover another student in an attempt to protect that student. Unfortunately, those five shots went through her body killing the other student. Yet, Andrew Pollack is not calling for gun control legislation but measures that would harden the schools against shootings. Kyle Kashuv, a survivor of the Parkland, Florida, shooting, is supportive of the rights of the people to keep and bear arms and has joined with Pollack to fight for the same initiative – hardening schools against these types of shootings. The Daily Caller provided a video of Pollack and Kashuv conveying to the American public their stance and support of the God-given unalienable right to keep and bear arms. According to The Daily Caller, the media does not want to even acknowledge their message, much less endorse it. In truth, neither does the Hogg and Gonzalez cult, which is what those clinging to their false, ridiculous, slanderous rhetoric are. Unfortunately, these "children," being abused and used by the lamestream enemedia, the Soros groups, and pro-gun confiscation groups, call for, nay demand, law-abiding citizens be punished for the actions of one individual through legislation making gun owners criminals and eliminating the right to keep and bear arms. Hogg and Gonzalez have inspired thousands to dehumanize, malign, slander and marginalize gun owners and those supporting God-given rights of every individual to self-defense using a firearm. There is no middle ground when it comes to God-given rights. With this "children's" group, there is no open forum for discussion; it's their way or those against their platform are apathetic to children being killed in school, undeserving of humanity, and basically, are the bottom of the barrel scum eaters. This is how those who support, uphold and defend the Constitution are viewed by this cult. To members of this new cult, it is apropos to leave trash in the street since no citizen in the republic's capital is deserving of respect because of the corrupt, criminal politicians who happen to occupy the city in order to enact legislation have not "jumped to" at their behest. On the flip side, these cultists welcome protection by "good guys with guns" as long as those guns are in the hands of government law enforcement, the military, and private security personnel used by the Hollyweirdos and elected officials. It is almost ironic that these cult members ask for government to protect them, make them safe, when it was government, the Broward County Sheriff's office and the SRO, who failed to provide protection and safety. It's an oxymoron for sure. Remember, these "kids" would never have garnered any steam for their movement if the lamestream enemedia had not promoted these anti-gunners so hard, had domestic terrorist groups, such as the Women's March that support Louis Farrakhan and Islam, providing funding, and had the involvement of George Soros' groups. This is about as much a "grassroots" movement as moss growing on a bathroom tile floor. Despite these cultists gaining a few useless gun control legislation in the "Ominous"bus budget bill, they will not be satisfied until gun confiscation legislation is enacted at the federal level and people are forced by the barrel of a government gun to surrender their right to keep and bear arms. So, this needs to be taken seriously and not brushed off as "kids" trying to influence legislation. These "kids" have large gun-grabbing associations behind their trash talk. And, everyone knows George Soros calls the shots with many politicians in the District of Criminals. The more these cultists appear on television and are promoted by these organizations to spew lies, conjecture and slander, the more gullible public will begin to believe it. It follows the premise, "Tell a lie often enough and people will believe it." Previous Who Runs March For Our Lives?